“It was an unbelievable day." The words of Pieter Hine, a football coach from Reading who realised a boyhood dream by taking the field at Wembley Stadium last Sunday. Pieter took his Prospect Pumas team to the home of English football for a grand day out as part of the first ever FA McDonald's Coaching Masterclass. 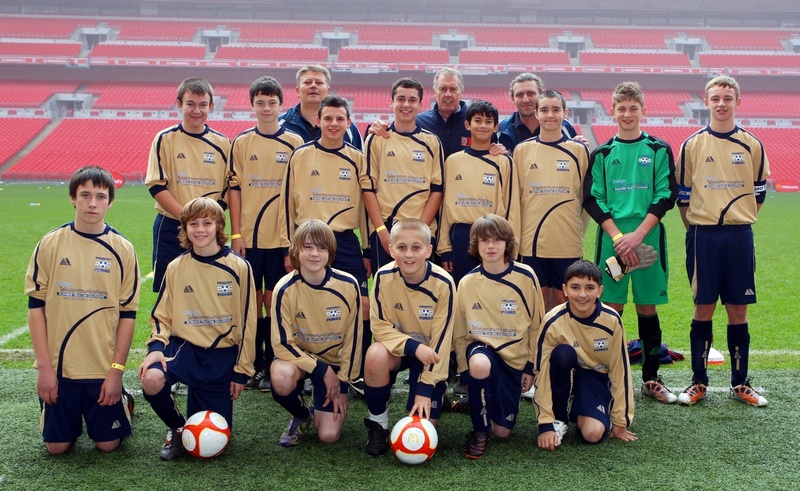 The Pumas, whose website is powered by Club Website, were one of 12 grassroots teams taken through on-pitch coaching workshops by legends of the game including World Cup winner Sir Geoff Hurst and Eric Harrison, former Manchester United youth team coach. The Pumas made a day of it with almost 70 club members making the trip from Reading, kicking things off at the Madjeski Stadium - Reading FC had allowed the Pumas use of their players' parking - and travelling together down the M4 by coach. After being welcomed to Wembley by Sir Geoff and Harrison - the man responsible for developing 'Fergie's Fledglings' - the Pumas squad and coaches got a taste of the Wembley changing rooms before walking out of the famous tunnel and onto the hallowed turf, while their proud parents looked on from the stands. Hine and his fellow coach and "best mate" Tony Verney then led the Pumas squad through a series of drills, receiving coaching advice and expertise throughout by the FA and McDonald’s football ambassadors. 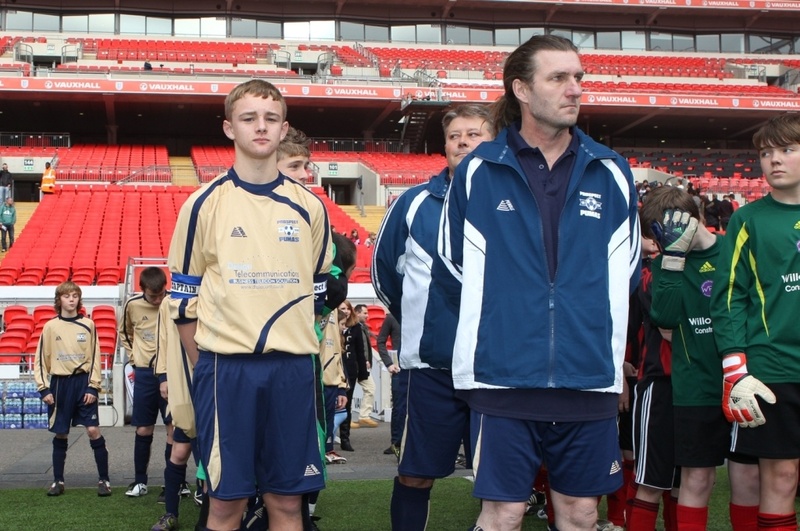 Having picked up tips from Arsenal legend Martin Keown, Manchester United Treble winner Andrew Cole and Northern Ireland’s most capped player, Pat Jennings, Hine reflected on a day he'll never forget. "The whole experience was just superb. It’s hard to take it in," he said. "I’ve been involved in football for 35 years and then you’re there in the Wembley tunnel. "You never think that will happen to you. It’s a lifelong dream. The Coaching Masterclass was the first of its kind run by McDonald's, a community partner of the FA who aim to support grassroots football by helping to raise standards and developing best practises. Over the next four years, McDonald’s has pledged to support over 6,000 local clubs and 400,000 volunteers, training a further 30,000 coaches, whose importance to the grassroots game cannot be overstated, according to their Head Coach. "I say to the grassroots coaches time and time again how important they are," said Harrison, "because seriously, without grassroots coaches, there is no football. It's a simple equation. "They do a fantastic job. They give up all their time for nothing. I admire them so much. 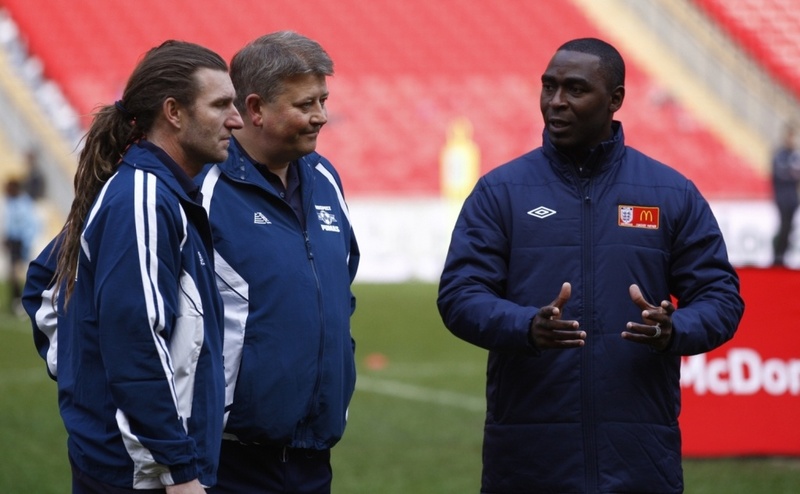 Without grassroots coaches, there would be no football. It's as simple as that." FA Elite Performance Director Gareth Southgate echoed Harrisons thoughts. “Every player needs a good coach to help them develop their game, provide motivation and be the best that they can be," he said. "We’re always looking to increase the number of coaches at grassroots level – individuals who are passionate about helping to nurture the players of tomorrow and want to provide professional advice. As Pieter Hines heads back to the 'day job' of coaching the Pumas in their usual surroundings, he'll reflect on an experience he'll certainly never forget and one that he recommends other coaches try to get involved in. “I say to other clubs 'just get your entries in'. It is worthwhile. All I did was enter a quick competition on the FA website and I was very lucky," he said. “We were very well looked after and the day worked superbly. The legends also spent a lot of the day thanking the coaches for what they do in grassroots football, which was great. I’ll accept that. You can visit the Prospect Pumas website at www.prospectpumasfc.co.uk. Images courtesy of Action Images / Peter Cziborra.